If you don’t know the language of tango, you’ll miss out on a lot, and for once, I don’t mean in a metaphorical sense. One anecdote I remember from my early days of tango was being told of a workshop that started with the following announcement: ”This is an advanced class, hence it will be taught in Spanish…” I’m not sure who it supposedly was that said it, but I have a similar experience with Gustavo Naveira teaching in Buenos Aires with lots of foreigners present: –Is there anyone here that speaks absolutely no Spanish? (lots of hands in the air) No Spanish at all? (fewer, but still quite a few hands in the air) Then he would go on teaching in Spanish with a few very short, Lost in translation-style summaries in English every now and then. The truth is that learning a little Spanish has been of tremendous value in the process of learning the tango. And with one noteable exception, all our main teachers the last few years have been Spanish only. As time went by, the number of words we picked up grew, but atras (backwards) and adelante (forwards) and ocho were ones that stood out from the beginning. Fast forward to today, and my Spanish (well Catalan, really) colleague introduces me to a fellow Spanish guy as “the guy that speaks Argentine”. A bit of an exaggeration, but still, we’ve come a long way, and it really helps connecting with people when you go there, even if they actually speak English themselves. Some Argentines insist they speak Castellano, not Español (Spanish), this is also a lesson from our very first trip, and we generally stuck to using the word castellano, as that seemed to insult or irritate noone, and made sure we knew they were no longer a Spanish colony :-) . Anquises argues that Español is the more correct term, though. In the process of improving one’s understanding of a language, a good dictionary is priceless. 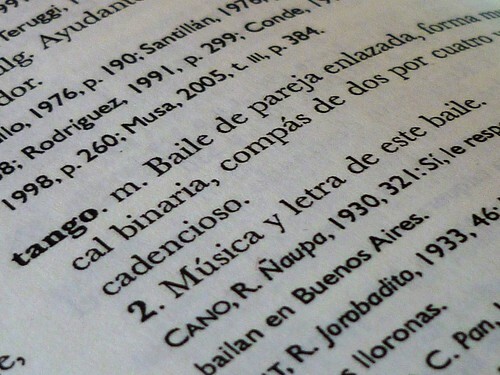 I already got the dictionary of Lunfardo, a regular Spanish dictionary, what I was searching for was an Argentine dictionary, but that turned out to be uavailable even in one of the great bookstores in Buenos Aires, El Ateneo. The guy in the bookstore told us they used the Spanish ones in school and everywhere else. While the Spanish dictionary will take you a long way, it doesn’t cover all the local usage. This was clearly demonstrated once as we went to the local pharmacy after looking up what we wanted in the dictionary, only to have them rolling over the counter laughing when we tried to put our newfound knowledge to work. What saved us was a little improvised acting combined with key Spanish words which finally revealed the term used in Argentina. A little body language trumps everything. Also there are a lot of slang expressions, and we found the slang dictionary Puto el que lee (diccionario argentino de insultos, injurias e improperios) in a bookstore, and found it would fill in nicely. The Argentines have an astounding number of names for prostitutes and both female and male genetalia, which all come in handy when you want to insult someone or just talk to your friends in a playful manner (¡Che, boludo!). It also has a hilarious appendix with a few tables letting you construct your own insults very easily as well as illustrations, for example covering ‘Grandes hijos de puta del Mundo’ and ‘Grandísimos hijos de puta del Mundo’ and correspondingly for Argentina. Unfortunately, I’m not enough into Argentine politics to get all the Argentines. Finally, one of the last days of our last stay, we started chatting about this with our great host, and he suggested we got the Diccionario del habla de los Argentinos. At last. This relatively recent publication actually passed our little test of words we learnt from some of our porteño friends, and we could look them all up in the dictionary. It was too late to buy it in Buenos Aires, but we ordered it from Argentina via Amazon. Amazing that you can actually get all of these books on Amazon! A bit more expensive, but it comes with this fuzzy feeling inside when there is mail from Argentina in the mailbox :-) The illustration photo is from this dictionary.